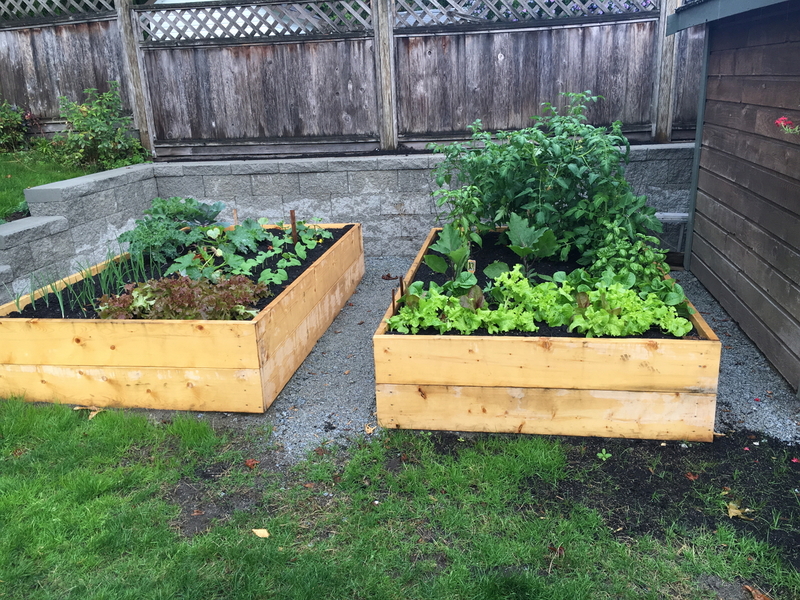 A lovely semi retired couple hired us to completely renovate the back and side yards of their home in Pitt Meadows. 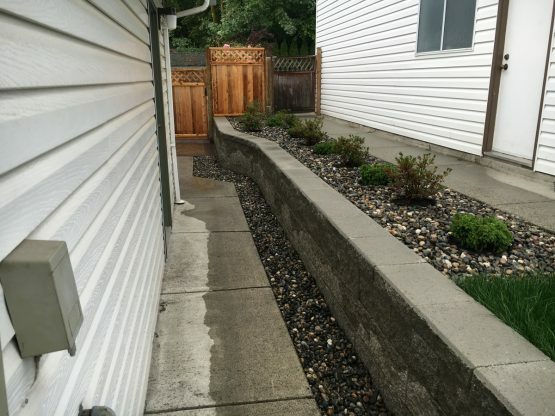 They had an old rotten deck and landscape tie retaining walls. 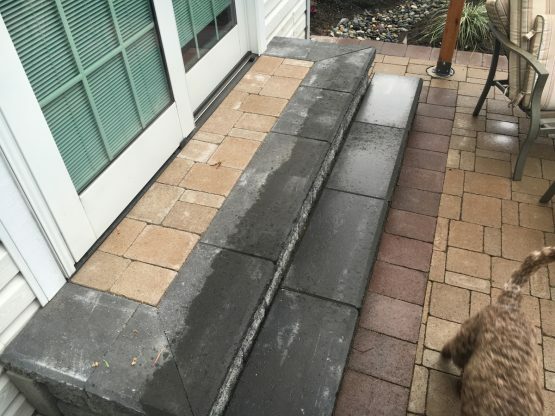 Together we came up with a design involving a paving stone patio that is much more durable than wood decking. We installed polymeric jointing sand between the paving stones in this job as well as most of our paving stone jobs. 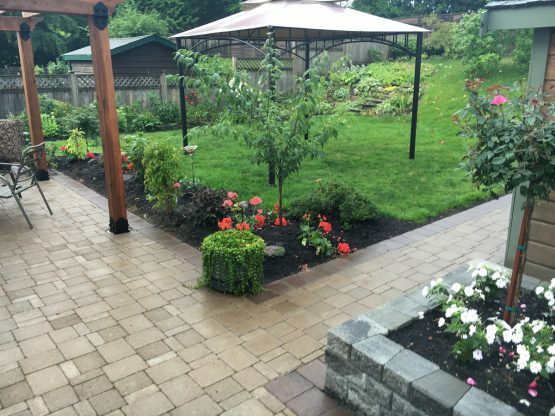 This sand does not wash away and prevents any weeds or ant hills forming from poor on going maintenance. We replaced the retaining walls and small planters with two different stones from Basalite and Abbotsford Concrete Products. 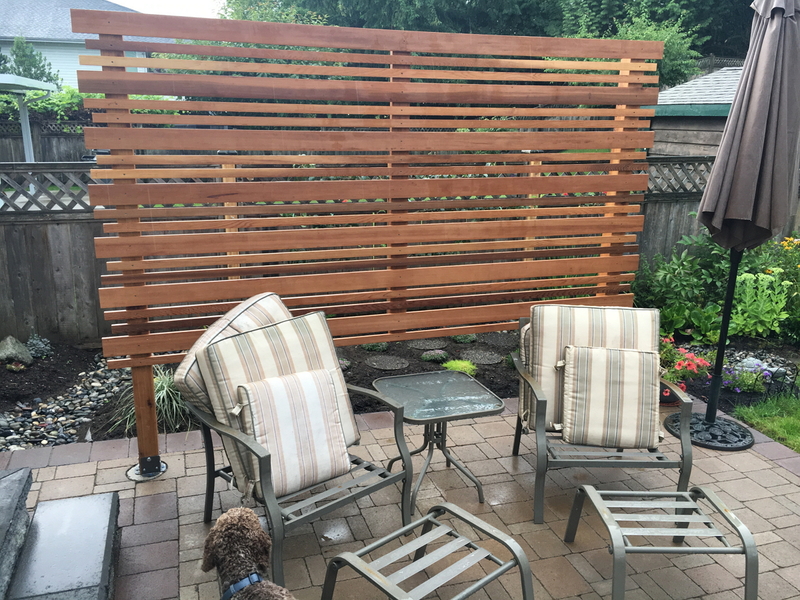 This job also included the construction of a large, high grade cedar, pergola over the patio with hardware from Lee Valley Tools. 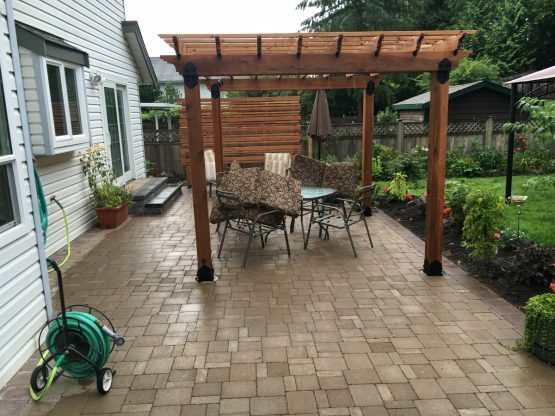 We pre-cut and stained the pergola at the shop and assembled it on site with Sonitube concrete footings. The wood work also included a privacy screen make from high grade cedar and some fencing and gate installation. 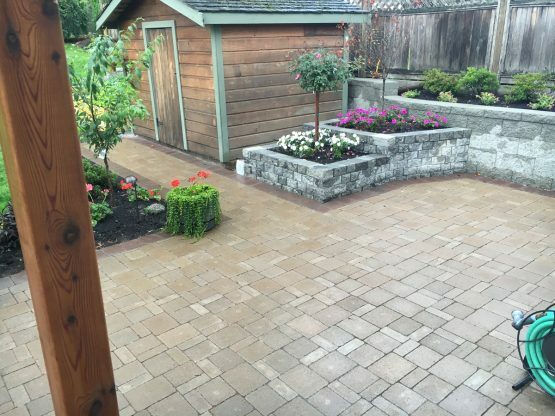 The finishing touches included the installation of outdoor lighting. 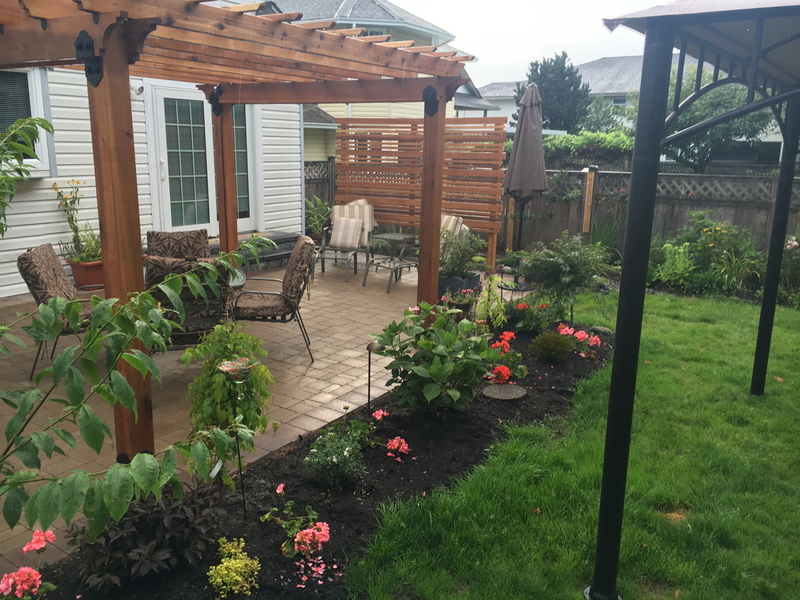 We installed two mini spotlights in the pergola to illuminate the outdoor furniture and a few path lights in the flower beds around the patio. 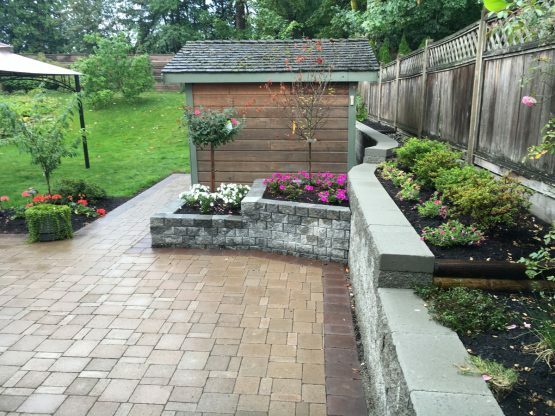 Giving this job a beautiful finishing touch to enjoy in the spring and summer evenings as well. Overall this project was very enjoyable to work on as the clients were very easy to work with and we took into account their great ideas to make their dream landscape come true.